A drug allergy or medication allergy is a hypersensitivity condition of the body against certain drugs and medications. When your body initially encounters a drug that the immune system deems potentially harmful, it creates antibodies designed to combat the particular drug or drug ingredient. When that drug or medication appears again, the immune system launches an attack, releasing chemicals into the bloodstream that try to fight off the drug, causing a range of allergic reaction symptoms. The most common drug allergies and medication allergies are to antibiotics including penicillin; pain killers (also called analgesics) such as codeine and morphine; non steroidal anti-inflammatory drugs like aspirin and ibuprofen; blood pressure medications; and anti-seizure medications. If you believe you have a drug allergy or medication allergy, an allergist may be able to perform drug allergy test to confirm. 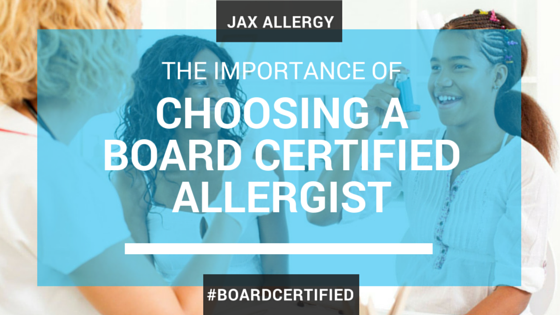 Drug allergy treatment may include antihistamines to relieve skin reactions such as itching, hives and rash; bronchodilators to relieve coughing and wheezing; epinephrine injections to treat anaphylaxis; and corticosteroids. In a controlled setting at your allergist’s office, desensitization may be used to build up a tolerance to the medication if it is needed. Allergy & Asthma Specialists of North Florida can help detect, treat and prevent drug allergies and medication allergies. Schedule an appointment at one of our convenient Jacksonville, Florida locations on University Boulevard the Westside, in Mandarin, or in Orange Park in nearby Clay County, FL.